Rachel Hammond (34) is married with children, aged seven, five and three. When Rachel and her husband knew their family to be complete, she figured running would be an easy, quick and cheap way to get back into shape, especially with small children. Like most people Rachel used the Couch to 5k program. She signed up ánd paid for an upcoming race to keep herself motivated to stick to the program. She can now easily run three to four miles, and the furthest she has run is six miles. Someday Rachel plans to run a 10k. During Summer Rachel runs three to four times a week. Because she doesn't like running in the cold, she's planning to get herself a threadmill to use during Winter. Even though Rachel took up running for the physical benefits it offers, she now also runs because it helps clear her head and decompress from the little and big stresses of daily life. The only running gadget Rachel takes with her is her music. Lately, she's been running to Pandora, because of the variety of music it offers, instead of listening to her same old running mix over and over. But she also has a running mix that helps her power through and keep her pace steady. While she was running a 5k in Traverse City, Michigan, Rachel was struck by some distinct parallels between running and motherhood. Rachel: 'Runners come in all shapes and sizes and run at different speeds, but with the same destination in mind. Moms are the same way. Rachel: 'Do it. Now. Don't worry about not being able to make it to the end of the block. You will be amazed how quickly you will be able to run five minutes… then ten minutes… then more! It's time you can take for yourself, and you will come back better for yourself and for your family. Wanna read more from Rachel? Then visit her blog MomColoredGlasses. 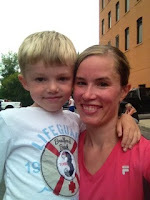 Love when you feature other real moms and their running stories. I can so relate! Thanks for sharing my running story...it was great to be able to verbalize the "why" behind my running...and I hope it inspires others to join in! I'm with Rachel - running's one of the best, most accessible, sanity-saving exercises that a mum could possibly do.